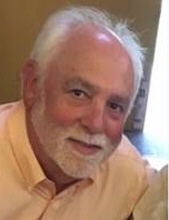 FRINK – Keith Frink, 66, passed away peacefully on Sunday, March 31, 2019 after a courageous battle with cancer. He was the devoted husband of Nancy (Nanni) Frink for 26 years. Keith was born on September 28, 1952 in Winsted, CT; the son of the late Raymond and Jean (Hayden) Frink. Keith retired from Mitchell Subaru in Canton, CT in 2017 after having been employed there for 33 years. He was an avid NY Yankees and 49er’s fan. He loved golfing and was a loyal NASCAR fan. In addition to his dedicated wife, he is survived by cherished daughter, Kelley Conley and husband David of Groton, MA and stepson, Jeremiah Beach of Sonoma County California; sister, Ruth Layton and husband Michael of Winsted; sister-in-law, Jeannine Frink of Colebrook; father in law Paul Nanni of Winsted; and treasured grandchildren, James and Caroline Conley as well as several beloved nieces and nephews. He was recently predeceased by his brother Robert Frink and his faithful canine companion Murphy. Friends may call on Sunday, April 7, 2019 at Montano-Shea Funeral Home, 922 Main Street, Winsted, CT from 2 – 4 PM. Funeral services will be held on Monday, April 8, 2019 at Montano-Shea Funeral Home, Winsted, CT at 11 AM. Burial will be private. Visit an online guestbook at Montano-shea.com. To plant a tree in memory of Keith Frink, please visit our Tribute Store. "Email Address" would like to share the life celebration of Keith Frink. Click on the "link" to go to share a favorite memory or leave a condolence message for the family.